Origin Originating from Africa, South East Asia and Australasia. Shapes Broadly oblong, compressed and wrinkled. 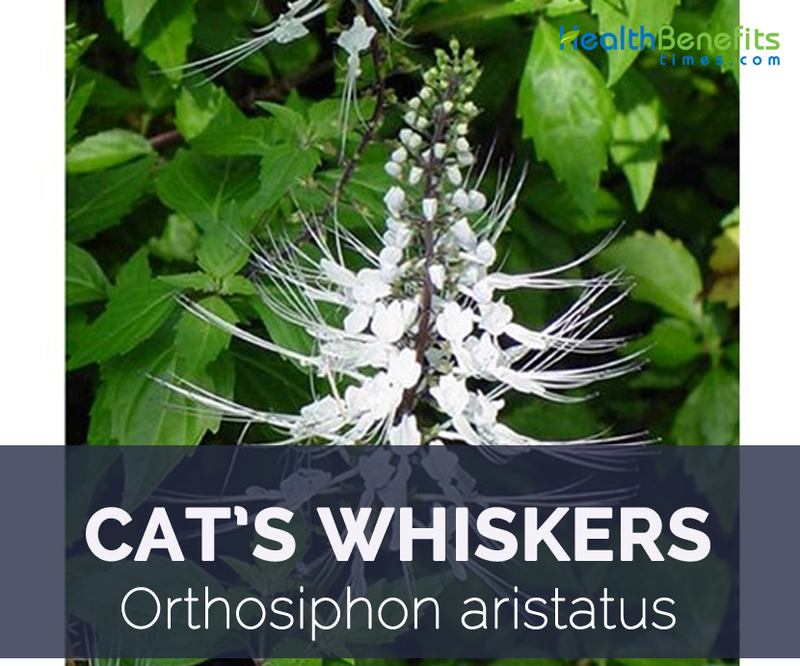 Cats Whiskers (Orthosiphon aristatus), also known as Java tea of Kidney Tea Plant, is a branched herbaceous plant that belongs to the family Labiatae or lamiaceae. The herb is popularly referred as Balbas Pusa. The plant is a medicinal herb found mainly throughout southern China, the Indian Subcontinent, South East Asia and tropical Queensland. It is known as kumis kucing in Indonesia and misai kucing in Malaysia. In the US it may be commonly known as cat’s whiskers or Java tea. The scientific name ‘orthosiphon’ refers to the upright tube shape of the flower and ‘aristatus’ means ‘with ears’. 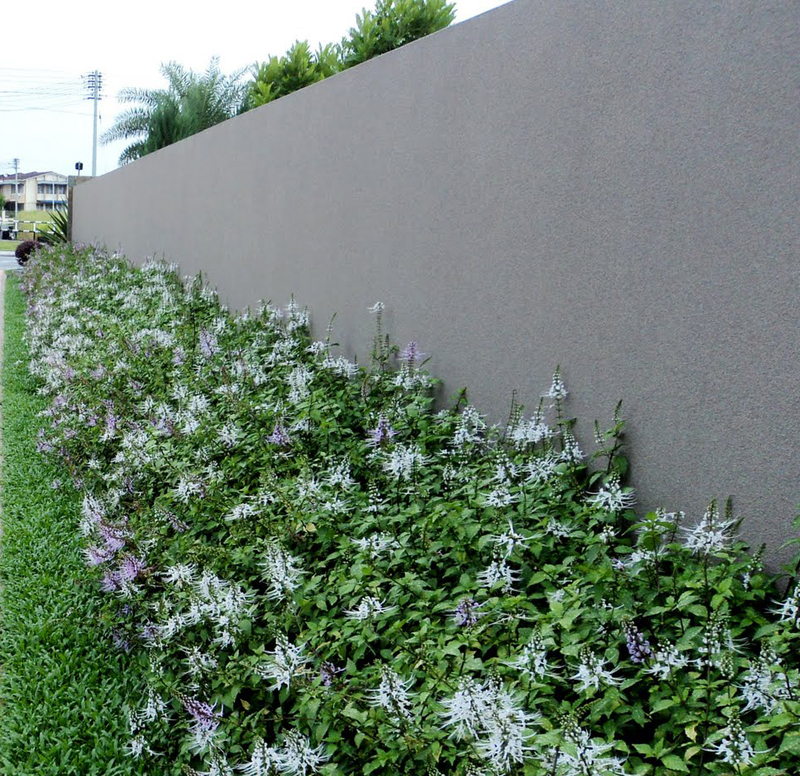 It is a fast growing, perennial garden plant that grows to a height of 1-2 meters. Apart from Cat whiskers it is also known as kidney plant, Indian kidney tea, Java tea, Kabling-parang, Mao xu cao, pokok misai kucing, Yaa-nuat-maeo, Kidney Tea, Kumis Kucing, Kumis Kutjing and Kitty Whiskers. Yes we this article is not advising about cats. Cats Whiskers is small herbaceous perennial shrub about 1-2 meters high. 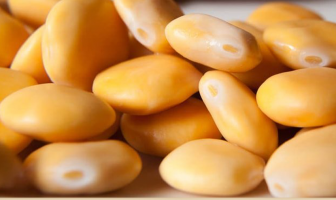 It grows well in full sun in mild climates and prefers well-drained soil high in organic content that can hold moisture, neutral to slightly alkaline pH. 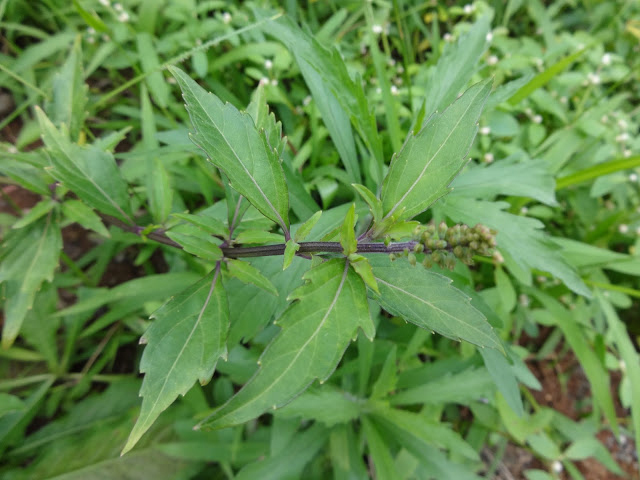 Plant has purple, four-sided stems that are coarsely toothed. Its dark green leaves are 5-10cm long, slightly glossy, narrowly ovate and deeply veined. They are held in pairs, end in points at each end and have coarsely toothed margins. 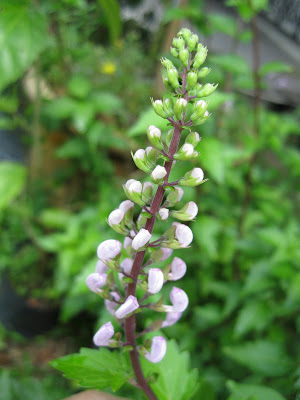 Flowers range from white through to light mauve or pink with the slender tube shaped corolla being 2.5 cm. It is nearly 3 times the size of the bell shaped calyces. The ‘whiskers’ or stamens extend outwards up to twice as long as the flower itself, giving the impression of cat’s whiskers. Cat’s Whisker flowers from late summer to autumn. The nutlets are broadly oblong, compressed and wrinkled. The flowers make an eye-catching display in gardens. It is cultivated for Java Tea on the islands of Sumatra and Java. It grows naturally in forest edges, but is commonly seen along roadsides and wastelands. Only the leaves are edible and are widely used for herbal teas (Java Tea) in south-east Asia. Other plant parts are toxic! 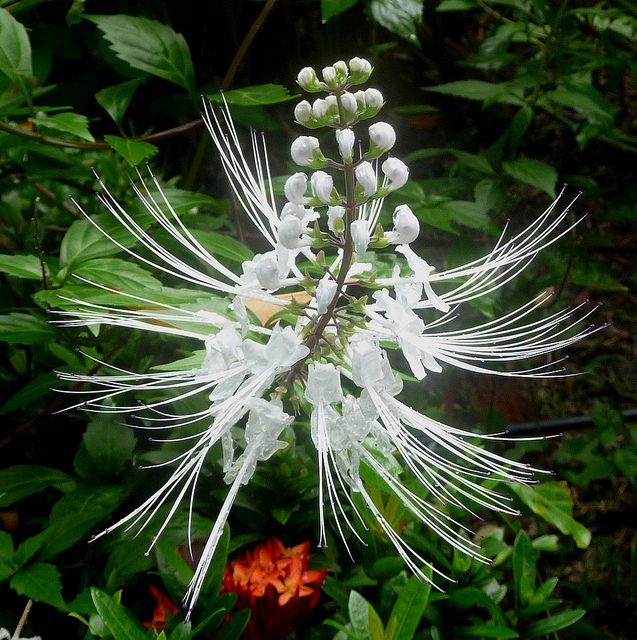 Also referred to as java tea, cat’s whiskers are found in several places all throughout Southeast Asia, and even a few places in tropical Australia. Commonly used as an ornamental plant because of its beautiful white flowers, and distinctive delicate petals that spring up much like a cat’s whiskers (hence its name), it is also used as a source for nectar and as a means to attract birds due to its inviting aroma . Cat’s whiskers show great promise in treating respiratory problems like Asthma and Cough. To make it effective against counteracting respiratory problems this medicinal herb is often mixed with other powerful herbs which acts surprisingly well against respiratory problems. Chemicals present in Cat’s whiskers help in reducing blood pressure levels. Some believe that the anti-oxidant and anti-inflammatory actions of the herb are the reasons for this benefit. The chemical methylripariochromene present in the herb could decrease systolic blood pressure in rats. Cat’s whiskers are an amazing herb with loads of properties it is one of the best herb available in the world. Its other benefits include treating short breath and nerve related problems. The only thing to be taken care before using this herb is its dosage as to which should be carefully checked before consumption. Since over dose may have several harmful effects to our body. Cat’s whiskers consist of compound which helps to prevent the growth of parasites and foreign hosts that live on a body. They do so by cutting the nutrient supply chain of the fungus. Therefore Cat’s whiskers could be applied to the areas where fungal infection has infected. The term ‘diuretic’ refers to a substance that helps to increase the flow of urine. It is supposed that sinensetin and the tetramethoxy-flavones present in this herb help to increase the flow of urine by relaxing the muscles of walls of the internal vessels. The diuretic action of this herb can also be attributed to Methylripariochromene A. In a research conducted on hyperuricemic rats, the use of cat’s whiskers herb was associated to reduce serum urate levels. 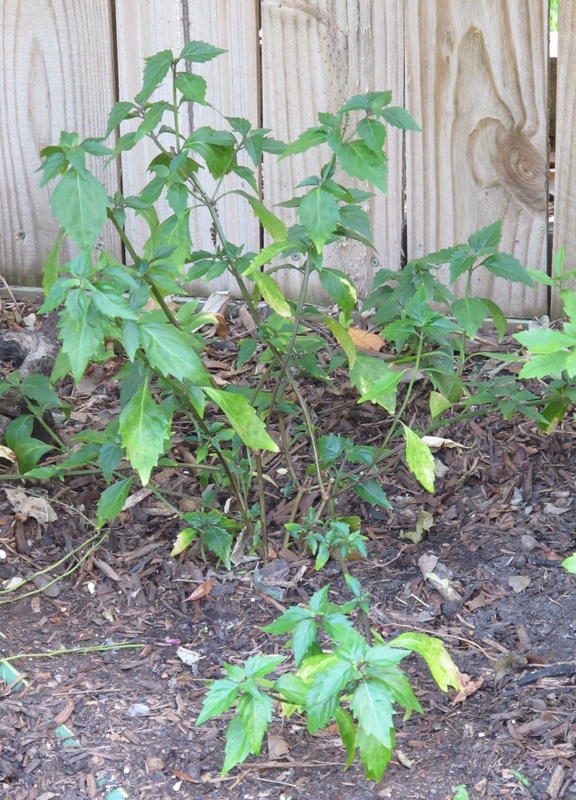 The results showed the diuretic and hypouricemic effect of this herb in rats. Owing to Cats whiskers property to cleanse tracts and ease the working of the system it has been found very effective in treatment against infections in the bladder and also preventing bladder problem from occurring in the future. 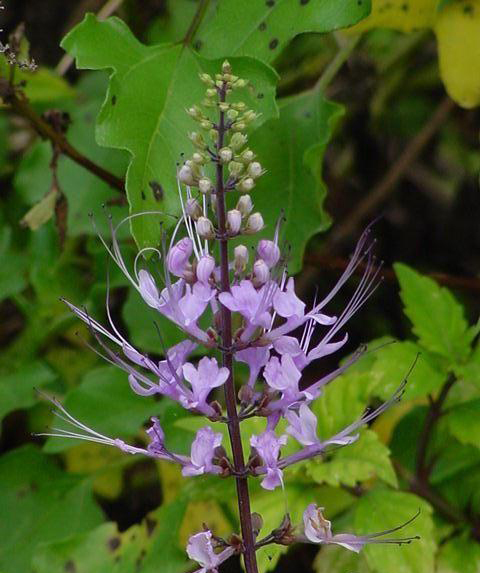 Cat’s Whiskers also popularly referred as the Kidney plant possibly due to its kidney saving benefits. In Java islands, it is believed that the tisane made using the leaves of Cat’s whiskers can efficiently eliminate kidney stones (up to 5 cm in size). This benefit has been verified in a few clinical researches as well. The herb is used to treat acute and chronic kidney infections, bladder infections, urinary tract infections, frequent urination and bladder stones. Cats whiskers have been consumed on Java islands since a long time ago as so are also called as Java Tea, the reason people of Java consumed this herb was that of its cleansing properties. It acts as a natural cleanser and therefore sweeps our body of unwanted toxins and foreign materials. Cat’s Whiskers work as miracle for treating blood sugar, several scientific studies have shown that cat’s whisker effectively regulate the levels of glucose in sugar and thus help us control diabetes efficiently. It is to be noted that one must consult his or her doctor just before switching completely over to this herbs consumption. Cat’s whiskers has been discovered to help loose our weight. Due to its market value as a medicinal herb that also has added advantage of weight loss, it is sold in market in many forms such as pills, tea bags and extracts etc. Many times we suffer from problem related with swollen gums which could be due to any number of reasons, the pain related with it and the swelling could easily be alleviated by using Cats Whiskers. Cats’ whisker when processed gives oil. This oil is quite effective in treating a wide range of skin infections. It can easily treat against rough skin, dryness and various types of skin infections. Cat’s whisker consists of enzymes that relieve you from Gout. It has enzymes such as flavonoids and natural acids that lessen pain and therefore comforting us from any type of pain. It has also shown progress in treating arthritis. Orthosiphon leaves can be used to increase urine output and for flushing the urinary bladder in a supportive way with mild symptoms. Traditionally used to support the excretory function of the kidneys. For rheumatic pains and coughs, a cup of tea is made with 15-20 leaves, drinking 1-2 cups a day. Java Tea is used to treat mild kidney symptoms in conjunction with drinking lots of fluids to flush out the bladder. Leaves of the cat’s whiskers plant can be chewed or pounded and stuffed on a tooth with cavities to ease the pain and prevent the swelling of gums. It may also be pounded and used as a poultice to relieve swelling. When used as a strong decoction (especially when prepared fresh), the leaves of the plant is said to be useful for treating a wide variety of ailments, such as gout, renal inflammation, kidney stones, and hypertension . Cat’s whiskers may also be brewed and drunk as a treatment for osteoarthritis and rheumatism. Cat’s whiskers may be drunk as a general tonic, as it is said to purify the blood and cleanse the kidneys. Cat’s whiskers are also helpful for relieving stress and tiredness. Leaf extract is of particular use in lowering the blood sugar levels in diabetics. They are used in the treatment of cystitis, urethritis and gout. They are used, in combination with other plants such as Sonchus spp or Barleria spp, to stimulate the kidneys and as a medicine for nephritis, gallstones and diabetes. Combined with the leaves of Blumea balsamifera and Phyllanthus fraternus, plus the rhizomes of Curcuma xanthorrhiza, the leaves are used to treat jaundice. Combined with the leaves of Andrographis paniculata, they are used to treat diabetes. In mixtures with the leaves of other plants, they are also used against gout, rheumatism and arteriosclerosis. In Holland and France, reported use for treatment of genitourinary diseases. Traditionally used for bladder catarrh, diabetes, kidney diseases, for hypertension and as diuretic in Malaysia. Plant is used as a diuretic, as well as treatment for influenza, eruptive fever, rheumatism, hepatitis, jaundice, and biliary lithiasis in Vietnam. Plant is used with a mixture of other herbs to treat jaundice, diabetes, gout, rheumatism, and arteriosclerosis in Indonesia. Leaves of O. aristatus are used as a diuretic in the treatment of nephrosis and severe oedema in India. Leaves are used as tea in kidney and bladder diseases in Manipur. Infusion of dried leaf has diuretic effect and increases uric acid excretion. Add cat’s whiskers to a flower garden, group them along walkways and set individual plants in containers for warm-season color. Difficult urination: Boil a glass of fresh water with ¼ handheld leaf cat whiskers up to ½ cup liquid form. Each ½ cup should be drink 2 times a day. Kidney stones: The herbal infusion should be created with 6 g cat whiskers, water 110 and herb meniran 7. It should be drink 100 ml for 2 times a day. Diabetes: The infusion should be made with cat whiskers 20 strands, water 110 ml and 20 strands of bitter leaf 100 ml should be taken one time in a day. Lumbago: The infusion should be made with 1 handful of fresh cat whiskers, 110 ml water and papaya bark area of 4 cm. 100 ml should be drink in a day for one time. For colds: Three cats whiskers leaves should be washed and boiled with a glass of water until it is half. For urinary stones: 90 grams of cat whiskers leaves should be washed and boil the leaves with one liter of water till half is remained. Then it should be cooled. Kidney stones: 3 handheld cat whiskers should be picked. The leaves should be prepared in nasty shard amount of 5 pieces. The ingredients should be boiled with 2 cups of water. It should be drink twice in a day. Gout and Uric Acid: Boil 5 plants meniran, 5 leaves cat whiskers in 2 cups of water till the 1 glass remains. It should be drink 3 times a day till it is healed. Diabetes, Hypertension and Facilitate urine: Boil 2 cups of water with 2 handful of cat whiskers leaves until 1 cup remains. It should be consumed one time a day for best results. The allergic reactions are doubted. The intake of cat whisker tea for a long term reduces the sodium levels in the body. The pregnant women should avoid the consumption of java tea.